Flyer for No Se No’s exhibition Exchange Show Japan with Art Unidentified, 1987. Photocopy, 8 ½” x 11″. The Rivington School included a number of Japanese artists who lived in New York, most prominently Toyo Tsuchiya and Ken Hiratsuka. 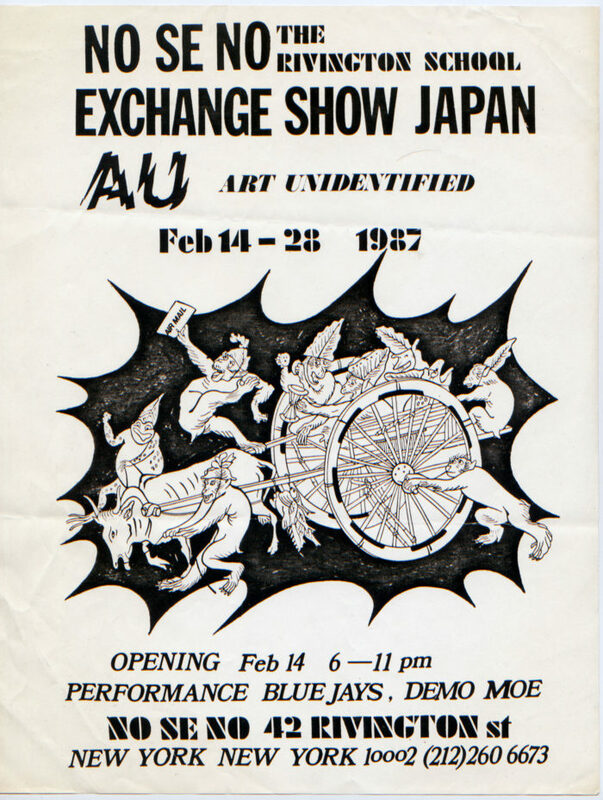 When Toyo was the director at No Se No, he arranged this “exchange show,” featuring the Japanese art group Art Unidentified. The following year, Toyo, Ken, Ray Kelly, Linus Coraggio, and FA-Q travelled to Osaka, Japan.